Stocks took another step toward breaking into positive territory for the year. 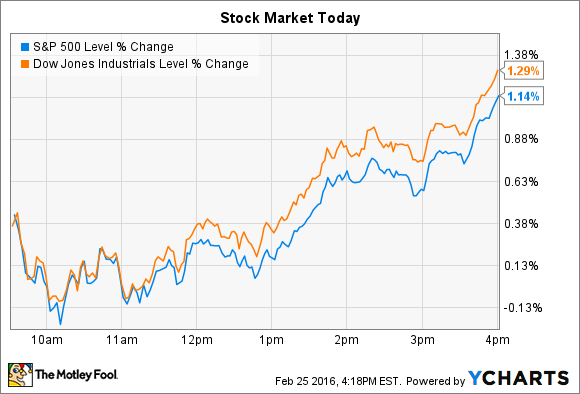 After a sluggish start, stocks rose in afternoon trading to end solidly higher yesterday. The Dow Jones Industrial Average (DJINDICES:^DJI) added 220 points, or 1.3%, and the S&P 500 (SNPINDEX:^GSPC) gained 22 points, or 1.1%. Many of the hardest-hit sectors led the market higher as investors pushed up shares of financial companies and energy stocks in the context of a slight rebound in oil prices. For the year, the Dow and S&P are now down less than 5% so far after breaching double-digit losses in early February. Salesforce.com (NYSE:CRM) and LendingTree (NASDAQ:TREE) were two of the market's biggest individual movers yesterday. Both companies' shares jumped as investors digested their quarterly earnings figures released before the opening bell. Salesforce.com rose 10% in the wake of strong fourth-quarter earnings, and a freshly raised outlook for the current year. Revenue spiked 25% higher this past quarter, the company announced, or 27% after accounting for currency swings, and adjusted earnings came in at $0.19 per share. Both the top- and bottom-line figures matched consensus estimates. Salesforce's executive team is seeing a few positive business trends pushing results higher right now. Operating margin rose by two percentage points in 2015, which helped cash flow jump up by 37%. Meanwhile, the company ended the year by securing its highest number of large-client transactions. Deferred revenue, which represents contracted but not yet billed deals, rose 25%, to reach $7.1 billion. "By any measure, this was a spectacular finish to the year," CEO Marc Benioff said in a press release. "The tremendous response to our customer success platform is driving exceptional growth for Salesforce across every region, every cloud and every industry," Chief Operating Officer Mark Hawkins added. Backing up those bullish declarations, Salesforce raised its 2016 sales guidance to $8.12 billion, which would represent 21% growth over last year's result. While that would mark a slight slowdown from last year's 25% growth pace, the new revenue target is above Wall Street's forecast of about $8 billion. Consumer loan giant LendingTree soared 23% higher yesterday, which put shares back ahead of the market in 2016 after having trailed indexes by as much as 40%. The stock popped in the wake of the company's strong Q4 business trends and raised outlook for the current year. Revenue rose 78% in a quarter that CEO Doug Lebda described as "phenomenal." But the real story was the rise of LendingTree's new business -- ones that aren't the mortgage products that helped it build a dominant presence in the consumer-lending industry. Sales of non-mortgage products, like personal loans, credit-card loans, and home-equity loans, tripled year over year, and now account for 40% of the business, up from 24% a year ago. Management believes that this success demonstrates that the company has a larger addressable market than just mortgage demand. In fact, the Q4 results are "proof that the LendingTree brand can be leveraged to successfully expand into new financial categories while growing our existing products," Lebda said. The sales target for the current year was hiked by 20%, to $380 million, at the high-end of executives' target. Better still, management boosted its adjusted earnings target by 25%, indicating expanding profitability in the context of sharp market growth. As a result, it's no surprise that investors reacted by sending shares significantly higher.